Achilles tendinitis is inflammation to the Achilles tendon on or near its attachment to the back of the heel and is very common. It is usually due to a sudden change in one’s training regimen. It is also seen in people with tight calf muscles, poor biomechanics (flatfeet, high-arched foot) and those who wear bad or worn shoes. There will always be pain in the back of the heel getting out of bed in the morning or after sitting for a prolonged period of time. As one walks, the pain and stiffness lessen. If untreated it may worsen to pain with some burning in the back of the heel throughout the day. Walking may become very difficult. The inflammation may weaken the tendon, causing it to rupture. Treatment may include Rest, Ice, Anti-inflammatories, Heel Lifts, Orthotics and Physical Therapy to reduce the inflammation and improve flexibility and strength. Immobilization in a cast or boot may be indispensable, especially in patients who have difficulty walking on a daily basis. This may be necessary for 4-6 weeks. Excellent results have been achieved using this treatment approach. If conservative care fails, surgery may be necessary to alleviate the problem. This can include removing scar tissue in and around the tendon. This will help to improve its function. In some cases, there will be a peritendinous inflammation which does not generally progress to degenerative tendinosis (nor rupture). In other situations, there will be clinical inflammation, but objective pathologic evidence for cellular inflammation is lacking, and in these conditions, the term tendinosis is more appropriate. A degenerative process which can occur w/o signs of inflammation (mucoid degeneration). Tendinosis may be related to the region of diminished blood supply just above the tendon insertion. Often the tendinosis remains subclinical until it presents as a rupture. Often results from training errors in adults in their 30s and 40s. Heel cord contracture will exacerbate the patient's symptoms. On exam, patients generally have no strength deficit and do not have tenderness to deep palpation. Two forms of the condition are recognized (insertional and non-insertional). Occurs proximal to retrocalcaneal bursa. Generally responds well to non-operative treatment. Heel cord stretching (mild cases). A short period of immobilization followed by gradual mobilization w/ temporary avoidance of repetitive activities (running). Injections of steroids into or around the Achilles tendon may provoke rupture and should generally be avoided. and if injections are used, the patient must agree to avoid strenuous activity for several weeks. Tenderness is localized to calcaneal tendon insertion. Pain is related to contact between posterior calcaneus and Achilles tendon. Haglund's deformity may be related to this condition. 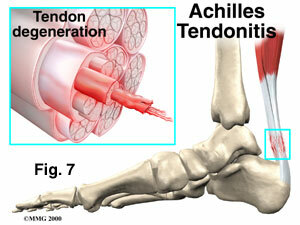 Localized calcification within the Achilles tendon can be a cause of insertional tendinitis. If excision of the calcified mass is being considered, an MRI should be obtained to ensure that there is not a more proximal degenerative tendinosis (which would not be expected to improve from excision of calcified mass). Alternatively, consider an ultrasound examination by an experienced physician can help determine the severity of the tendinitis. Pictured below is an image of the back of the heel where the severe swelling from Achilles tendonitis is visible. The swelling from this condition is not always this visible, but this is a case of long-standing tendonitis/tendinosis.